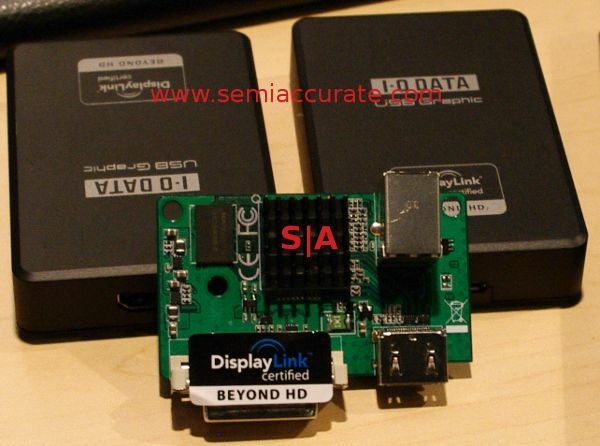 Displaylink is showing off final, or near final, USB3 monitor adapters. With the bandwidth problem that limited earlier variants now a thing of the past, the new parts are looking really nice. The short story is that you can now drive a 2560 * 1600 display from a single USB3 port, and add monitors until you run out of USB3 ports. Not only that, but you can drive 4MP with one DisplayLink chip, be it one 30″ monitor or two 1080p TVs, take your pick. These chips will open up some serious doors for the display market. As you can see, a single chip can support a docking station/port expander better than most dedicated hardware links. The one above has two USB3, HDMI, Dual Link DVI, and ethernet ports, all from one USB3 input. Of course you can’t get anything near full bandwidth out of all devices at the same time, but for a laptop without the needed ports, what else are you going to do? If you run the numbers, a 4MP display at 32b color and 60fps needs about 7.5Gbps of bandwidth, but USB3 only supplies 5Gbps. That said, with a little bit of lossless compression, 4MP is easily doable with bandwidth left over. In the IDF demos, the displays looked great, even full motion 1080p movies were smooth and clear. If you are not convinced about USB3’s inherent goodness, and this doesn’t do it, you are a lost cause. The first pictured board is big, clunky, and more like a docking station than an adapter. As you can see above, the dedicated adapters are much smaller than a dock, quite pocket-able. If you are a road warrior, you probably should have one of these in your bag, along with a long HDMI cable for the TV in your hotel room.